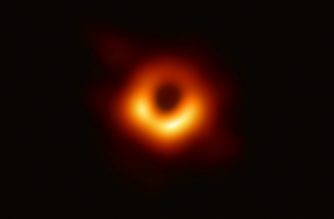 PARIS, France (AFP) — Astronomers on Wednesday unveiled the first photo of a black hole, one of the star-devouring monsters scattered throughout the Universe and obscured by impenetrable shields of gravity. The supermassive black hole immortalized by a far-flung network of radio telescopes is 50 million lightyears away at the center of a galaxy known as M87. Most speculation had centered on the other candidate targeted by the Event Horizon Telescope: Sagittarius A*, a closer but smaller black hole at the centre of our own galaxy, the Milky Way. Knitted together, they formed a virtual observatory some 12,000 kilometres across — roughly the diameter of Earth. “What we see in the image is the shadow of the black hole’s rim — known as the event horizon, or the point of no return — set against the luminous accretion disk,” Gueth told AFP. The more mass, the bigger the hole. At the same scale of compression, the Earth would fit inside a thimble. “We were desperately waiting for the data from the South Pole Telescope, which — due to extreme weather conditions during the southern hemisphere winter — didn’t arrive until six months later,” recalled Helger Rottmann from the Max Planck Institute.